The company brings domestic flight tickets at a lucrative price starting at just Rs 1,375. As part of the offer, tickets at this price are being offered for Bagdogra - Guwahati route. So, if you are planning a trip then you should hurry as the deadline to book the tickets is April 12, 2019. GoAir tweeted, "Explore India with our low fares! #FlySmart with domestic fares starting at ₹1,375*. GoAir flight ticket offer: GoAir is offering massive discounts on domestic flight tickets. The company brings domestic flight tickets at a lucrative price starting at just Rs 1,375. As part of the offer, tickets at this price are being offered for Bagdogra - Guwahati route. So, if you are planning a trip then you should hurry as the deadline to book the tickets is April 12, 2019. GoAir tweeted, "Explore India with our low fares! #FlySmart with domestic fares starting at ₹1,375*. Book now: https://bit.ly/2WWbNkJ." 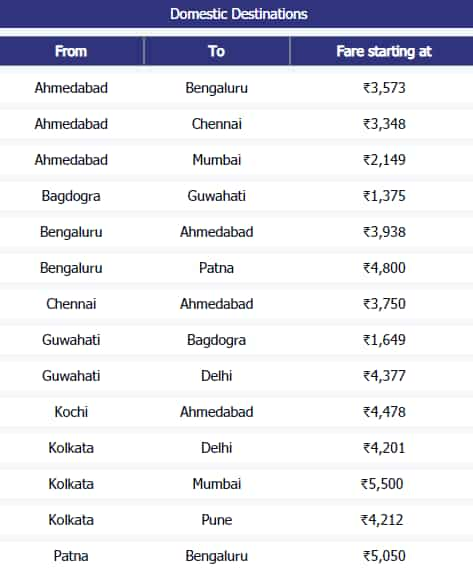 GoAir is offering tickets for domestic flights originating between Guwahati- Bagdogra which is offered at Rs 1,649, Ahmedabad- Mumbai at Rs 2,149, Ahmedabad - Chennai at Rs 3,348 and Ahmedabad - Bengaluru at Rs 3,573 respectively. To get these exciting offers the customer needs to pre-book the tickets for the travel till June 2019. Recently GoAir has also announced Rs 250 cashback if you book your air tickets on GoAir.in or Mobile app via Paytm wallet, the company tweeted, "Very flight will be rewarding when you #FlySmart!Get up to ₹250 cashback when you book your flights on http://www.goair.in or mobile app and pay via @paytm wallet. Hurry! Offer valid till 21st April 2019." Every flight will be rewarding when you #FlySmart! Get up to ₹250 cashback when you book your flights on https://t.co/It6A1JVDPu or mobile app and pay via @paytm wallet. Hurry! This offer is valid from 8th April to 21st April 2019. But there are also some terms and conditions for it, you can get only 5% cash back when you pay using Paytm at GoAir and maximum cashback is Rs 250. Minimum transaction amount should be Rs 1,000, and cash back will be auto-credited to your Paytm wallet within 24 hours.